During music therapy a therapeutic relationship is established and developed between the therapist and client through engagement in live musical interaction and play. A wide range of musical styles and instruments can be used in therapy to mirror how clients are feeling, including the voice. Using music in this way enables clients to connect with the world and express themselves, either as part of a group or in a one-to-one setting. Music therapy supports clients’ psychological, emotional, cognitive, physical, communicative and social needs. Benefits include improved self-confidence and independence, enhanced self-awareness and awareness of others and improved concentration. There are around 800 music therapists currently registered in the UK. Music therapists hold a Masters degree in music therapy and have a high level of musicianship and skill. Many, though not all, will have studied music at a university. Qualified music therapists must be registered with the Health and Care Professions Council (HCPC). Music therapy sessions start from around £40 and usually last around 40 minutes. In certain circumstances, it might be possible to access a grant for music therapy classes. To find a music therapist near you, visit the British Association for Music Therapy (BAMT) at https://www.bamt.org/ and click ‘find a therapist’. Once you’ve found a therapist they will ask you to fill in a referral form and invite you to a one-to-one session so they can find out what you want to get out of the therapy. It may be possible to attend a trial to find out if the therapy is right for you. 27-year-old Tess Jewson has been living with PH for over ten years. Passionate about music, she trained as a music therapist between September 2014 and June 2016 and has been helping people express themselves through music ever since. Read her thoughts here. “Music has always been a big part of my life. I started playing the piano at four years old and it’s always been my go-to. I play music when I’m happy, sad or frustrated because it helps me let out my emotions. My mum even brought my cello into hospital after three months because I missed it so much. As a former teacher I worked with children with all abilities, including children with autism which I found extremely rewarding. 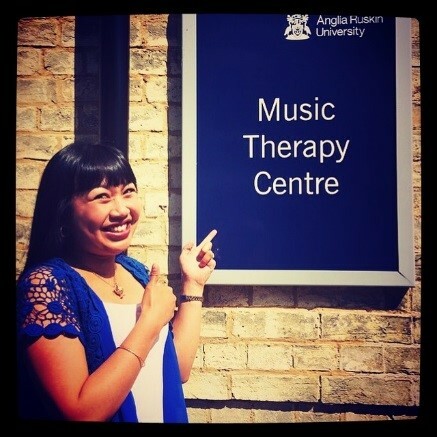 I really wanted to make a difference to their lives, so I decided to combine my passion for music with helping others and applied for a music therapy course at Anglian Ruskin University in Cambridge. I love being a music therapist and helping others express themselves through music. It’s not about teaching the client how to play music, but instead, using music to build a connection with them and mirroring what they are feeling. I believe everyone has the ability to respond to music. If someone is happy I’ll play something upbeat, if they’re sad I’ll play something to match their mood. Often when we’re sitting in silence I play the piano in time with their breathing which lets them know that I’m including them in the space. Many different musical instruments are used within a music therapy session to meet the client’s needs – so one day I might use a big double bass and then a tambourine the next. But the client doesn’t need to have any musical experience!